San Francisco Ballet is a world class company, known for its technical breadth, choreographic risk-taking and creative depth. Their leader, Artistic Director Helgi Tomasson, is not only a wonderful choreographer in his own right but also a master of repertory selection, choosing works that reflect SFB’s multi-genre fluency – traditional, romantic, neo-classical and contemporary. Program three’s offerings were an ode to this last category; a symphony of contemporary work featuring Ashley Page’s “Guide to Strange Places”, Mark Morris’ “Beaux” and Yuri Possokhov’s world premiere of “The Rite of Spring”. San Francisco Ballet in Page's "Guide to Strange Places"
Program three opened with the triumphant return of one of last year’s hits: Ashley Page’s “Guide to Strange Places”, a hybrid of neo-classical and contemporary ballet set to John Adams’ score of the same name. In this largely abstract work, Page (currently the Artistic Director of the Scottish Ballet) divides a cast of eighteen into four principal couples, two featured couples and a corps of six. There were a few Balanchinian moments, including Page’s use of second position throughout the many pas de deuxs and his commitment to intricate, fast footwork (one prime example being Vitor Luiz’s triple pirouette, temps de cuisse combination). 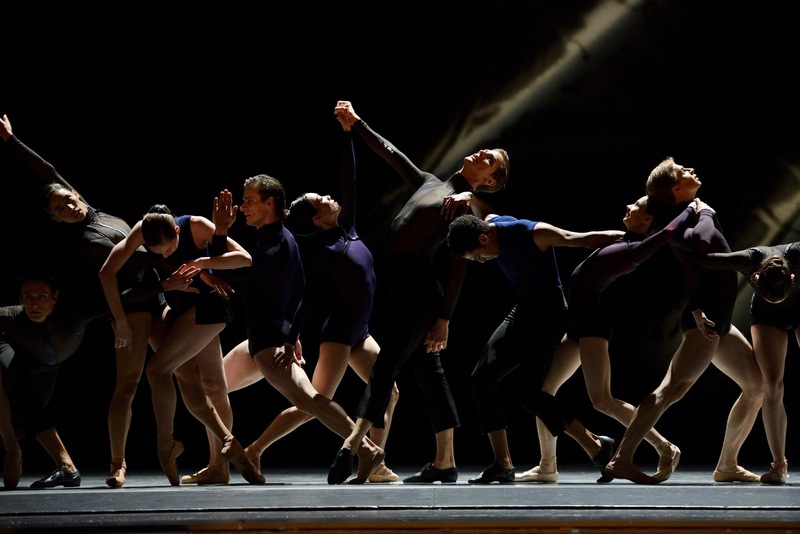 Throughout the non-stop movement, the ideas of exactness, precision, decisiveness and drama held true but the real message of Page’s ballet is evidenced by his exploration of transitory space. “Guide To Strange Places” is to ballet what a literature review is in academic circles; a physical inventory of the entire oeuvre where traditional syntax continuously met with avant-garde modern movement. And the key to bringing these two styles together in one cohesive work lies in their intersection. Perhaps the “Strange Places” that Page is discovering in this dance are in fact the complex transitions; the luxurious crossroads between the old and the new. Mark Morris is a choreographic favorite at San Francisco Ballet and his “Beaux”, (which enjoyed its world premiere last year) was yet another treat from this wizard of neo-classicism and modern choreography. In this work for nine men, Morris once again crafts the movement and music into a stunning artistic interplay. The imaginative choreographic representation of the score never ceases to amaze and delight the senses, though the real achievement of “Beaux” is in its quiet elegance. With nine men dancing and jumping all over the stage, you might expect a bunch of noise. But this was literally one of the quietest ballets I have ever seen, with the exception of three purposeful stomps that Morris had built into the choreography. And as expected with a Morris creation, there is also just the right dose of whimsy. In this dance, that joie de vivre was enhanced by the rainbow camouflage backdrop and matching unitards, both designed by Isaac Mizrahi. The final piece of the evening was the much anticipated world premiere of Yuri Possokhov’s “The Rite of Spring”. With it being almost exactly one hundred years since the curtain rose on the first performance of “The Rite of Spring” (Serge Diaghilev’s Ballet Russes in April 1913), the War Memorial Opera House was abuzz with excitement, wondering how this historic and tragic ballet would be re-envisioned. Possokhov did not disappoint. His choreography was primal and tangled, full of contorted poses, ample flexed feet and tortured lifts with bent knees and turned-in extensions. The scenic design (by Benjamin Pierce) was ominous, almost Graham-esque. And Dores Andre, as the sacrifice, transcended the moment – with her acting ability, stage presence and technical acumen, her portrayal was heartbreaking and enraging at the same time. You wanted to save her and prevent the pain that she knew was coming.